Just after the entrance of the park Shafer Trail Road is leading away from the official scenic drive. This road has been built along the sheer canyon walls, nothing for people with a fear of hight. After about half a mile its winding down into the canyon, within a few 100 yards we go from 5,600 down to 4,400 feet, and we are only one level deeper into the canyon. On this lower plateau the road leads all the way around Canyonlands on one side following the Colorado River on the other side back up again along the Green River, a total of about 100 Miles, 4×4 Jeep trail, very rocky and bumpy. We drive it for about 9 miles to Musselman Arch. 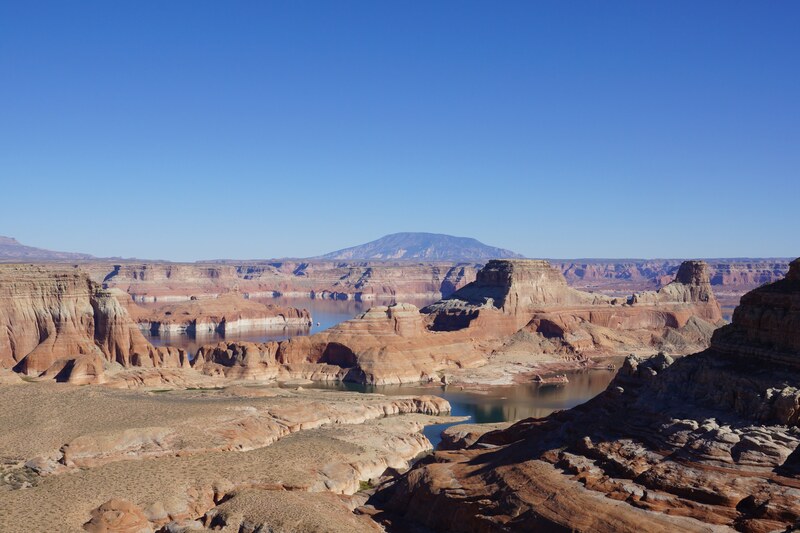 At certain points we can see the Colorado far below, winding its way towards Lake Powell. With all the breaks it takes us more than 2 hours to get there. The way back is a bit faster. To me Canyonlands is a bit like a small Grand Canyon, very fascinating. Early afternoon we go back to the hotel, check-in again and just, for once, take a break. At about 5:00 pm we head off again. We have a pizza and then we drive to Arches once more. Today we stop at different view points than yesterday. We enjoy the evening sun and the sunset there before coming back to the motel at around 9:00 pm. Let your imagination run wild when looking at the pictures (not just the once from today) and see animals, faces, city skylines, etc.